"DejaVu" redirects here. For the feeling that one has witnessed something previously, see déjà vu. For other uses, see Déjà vu (disambiguation). The DejaVu fonts are modifications of the Bitstream Vera fonts designed for greater coverage of Unicode, as well as providing more styles. The Bitstream Vera family was limited mainly to the characters in the Basic Latin and Latin-1 Supplement portions of Unicode, roughly equivalent to ISO/IEC 8859-15, but was released with a license that permitted changes. The DejaVu fonts project was started with the aim to "provide a wider range of characters ... while maintaining the original look and feel through the process of collaborative development". The development of the fonts is done by many contributors, and is organized through a wiki and a mailing list. 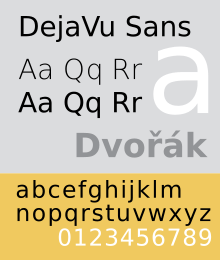 The DejaVu fonts project was started by Štěpán Roh. Over time, it has absorbed several other projects that also existed to extend the Bitstream Vera typefaces; these projects include the Olwen Font Family, Bepa, Arev Fonts (only partially), and the SUSE Linux standard fonts. Changes made by the DejaVu project are public domain, while the full project incorporates the Bitstream Vera license, an extended MIT License which restricts naming of modified distributions and prohibits individual sale of the typefaces, although they may be embedded within a larger commercial software package. 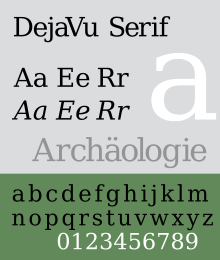 DejaVu fonts can be obtained from the DejaVu project on SourceForge. Some operating systems (OpenBSD, Solaris, Haiku, AmigaOS 4, GNU/Linux distributions such as Ubuntu, Debian, Fedora, and RHEL) include DejaVu fonts in their default installation, sometimes even using them as their system fonts. These fonts were also included in the proprietary BlackBerry OS, since its version 4.5, under the names "BBAlphaSans" and "BBAlphaSerif", until they were replaced in BlackBerry 10 with Slate. There has recently been some question within the DejaVu community about the role of scripts typographically incompatible with the typographically-similar scripts Latin, Greek, and Cyrillic (LGC). Most notably, Arabic has been added, but it has caused some software compatibility issues. Further, Latin and Arabic scripts have fundamentally different approaches to typefaces: while Latin fonts have serif and sans-serif versions, Arabic fonts have different distinctions (see Islamic calligraphy). It is still uncertain how the project should handle the mixture between different Latin faces and the different Arabic faces. The uncertain status of Arabic and other alphabets has led to the creation of DejaVu LGC, a subset of the DejaVu fonts which contains only Latin, Greek, and Cyrillic characters. This version also tends not to experience as many software issues. DejaVu is a project which aims for complete coverage of the alphabetic scripts, abjads, and symbols with all characters that are part of the MES-1, MES-2, and hopefully MES-3 subsets of Unicode. The coverage is already considerable, although some more work is needed to include more hinting rules for clear results at small sizes. Some kerning rules are still being developed for the Sans and Serif styles, for fine typography. Some work is still also needed to create ligatures in these styles. Original styles are marked in bold. The DejaVu Sans Mono typeface in particular is suitable for technical work, as it clearly distinguishes "l" (lowercase L) from "1" (one) and "I" (uppercase i), and "0" (zero) from "O", unlike the more widely available Monotype Courier New. A derivative of Sans Mono, Menlo, is provided by Apple with the Mac OS X 10.6 operating system. ↑ "Anti-aliasing and TrueType Fonts on OpenBSD". Frequently Asked Questions. OpenBSD. Retrieved 2014-04-11. ↑ "DejaVu – Download". Retrieved 2013-01-16. ↑ "DejaVu fonts – FedoraProject". Fedora Project. Retrieved 2013-01-16. ↑ "Package list – openSUSE". Retrieved 2013-01-16. ↑ "Packages included in Mandriva Linux One 2010". Retrieved 2013-01-16. ↑ Ronen Halevy (2009-08-07). "Like Those Pretty Fonts in OS 4.5+? Thank Bitstream (Bolt) & DejaVu". ↑ Alex Kinsella (2012-07-24). "Font Changes for BlackBerry 10". Retrieved 2014-12-23. ↑ "DejaVu – Current status". 2015-05-17. Retrieved 2016-07-09. Stephen Shankland (2006-07-11). "Open source casts new mold for type design". CNET.